The history of production of forms and dies in ČZ a.s. dates back to the beginnings of the company in 1919. Thanks to this long-term tradition, tool production was used for the production of weapons, bicycles, chains and various products for the automotive industry, such as forms for transmission boxes and turbo-chargers. The Tool Shop division currently has available 8,000 m2 of production area, a modern computer and machinery equipment, including a highly effective foundry line and long-term experience. Maximum dimensions of produced dies are 1600 x 1600 mm and weight 15 tons. In case of customer interest, we provide tool servicing throughout its lifecycle. In addition to the automotive industry, customers more frequently come from the furniture, consumer and electro-mechanical industry. The main goal is customer satisfaction, continuous modernization and improvement of production technologies. ČZ a.s. Tool Shop division is holder of a quality management system certificate according to ISO 9001. 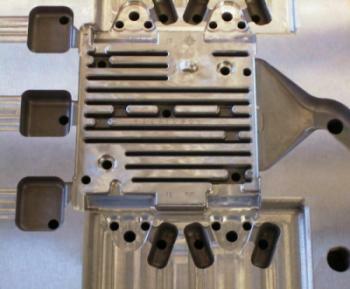 Design and production of pressure moulds for aluminium and zinc, injection moulds for plastics, model equipment and sample boxes, devices for clamping, measuring and machining, special gauges, special cutting tools, and processing machines for metal sheets.